How Long Can A Cable-Tow Be? This also means that I missed my flight home. I decided that while “vacationing” I was going to need a way to get around, so I started looking for a vehicle and ended up buying an H3. I assure you my decision was NOT based on gas mileage. Anyways… I had been able to travel around the greater Los Angeles area a bit and even visited a few Lodges. The Brotherhood is flowing very well on the West Coast. I had the pleasure to attend the Raising of a new Master Mason at Granada Hills Lodge #378, F&AM. This also marked the first time I have ever been investigated. Being that I grew up around the guys from my home lodge, I wasn’t even investigated when I petitioned back in 1998. Heck, it was a given that I was going to join the lodge when my petition was handed to ME to sign. Possibly after it was voted on… I never could get a straight story on that one. I do know that there was a bit of a pushing match for second and third line signers… Anyway, the investigation was a first for them too. I hold a life membership from my home Lodge and to save on expenses, I don’t get a dues card every year. I have a hard plastic card with my “credentials” on it. Did I mention that Cali doesn’t do life memberships? It was a night of first’s all around… The investigation would have gone flawless if there weren't four full grown men standing in a closet… All went well enough for me to be allowed admittance and the Degree went off without a hitch. I must say that every time I attend another Lodge, be it: NMJ, SJ, F&AM or AF&AM, I always see something that blows me away. This time, and strictly speaking of the opening of the Lodge, was not any different. I won’t get specific so as to not offend or violate my obligations, I will just leave it at, even though at the base, all of our “ritual” is mostly the same, there are intricate differences that make “traveling” that much more worth the time and effort. I am also pleased to say that my “traveling” has brought to where my masonic journey began, DeMolay. I continue to meet Brothers from this wonderful thing ours and every one of them welcomes me with love in their heart. I can’t help but wonder, having traveled as far west as I can (in the continental United States), how long can my Cable-Tow really be? I have found a true friend and Brother and grown my family with Bro. Robert P. Lewis, his Lady and their kids. Now that I'm back home in the midwest, my Cable-Tow stretches over half the width of the lower 48. My plans at that point had not all been exhausted and I had a few more adventures before my 2,000 mile drive home. But one thing proves itself to be true every time I travel, Freemasonry really is the greatest thing to ever happen to me. It never quits, takes a day off, calls in sick or ceases to amaze me. I have a confession. Something I haven’t spoken about. A little over a year ago, I was summoned; not to court, but summoned by King Solomon to appear at Pekin Masonic Temple for Degree work. Degree work?! But I’m not a Mason! As I read the summons, I had to chuckle. Pekin Chapter #25 Royal Arch Masons had summoned a group of Masonic Widows to appear for degree work called “The Royal Arch Widow Degree”. This degree is for women whose husband is out night after night at the Masonic Lodge. This degree had not been performed since the mid 60s so Pekin Chapter thought the current widows needed to go through this degree. So, this year they had the degree again and since I went through it last year, I was able to watch it from the sidelines. The "widows" are escorted into the lodge room by the royal executioners and are brought in front of grumpy King Solomon. Yes, King Solomon is a grumpy old soul. He asked these poor "widows" to remove their left shoe; this would be evidence of her sincerity and trust in the Order. The shoes are then sterilized in a “decontaminating fluid”. The women are escorted around the lodge room by the Grand Master of Ceremonies and are given the “secrets” of the degree. As you know, there are secrets in the lodge room and since I have been through this degree I am not allowed to reveal them. But, as a Royal Arch Widow, King Solomon did reveal a secret. He explained what the letters on the keystone meant. We were advised never to divulge them to anyone not entitled to receive them. But on a serious note, this degree has no connection with any Masonic degree, real or imaginary. It’s sole purpose is FUN and to provide entertainment for us women. After the degree work, the widows are presented a lovely wallet sized certificate and a pin. Oh, I bet you are wondering about the shoes. Well, if you are a Royal Arch Widow, ask your local Royal Arch Chapter to present the degree and find out what happens to your shoes. Editors note: This article in a condensed version appears in the February 2015 issue of The Northern Light, which is the AASR (Ancient Accepted Scottish Rite) of the NMJ (Northern Masonic Jurisdiction) magazine. Here for the first time it appears in it's entirety. What does a mason do when they see a Masonic artifact in a place outside a lodge? Will you leave it, as it brings light to the craft? Do you rescue it from a place where it isn’t appreciated? I was in such a position and I chose the latter. My son was accepted to R.I.T (Rochester Institute of technology) and we made the long drive to see the campus, in Rochester NY. Once the family got situated at the hotel, we went to the nearby TGI Fridays. I normally get a seat facing the front door, this time was no exception. As I sat and talked to my family, I looked at all the “ornaments” that TGI Friday’s normally hangs on the walls, oars/cowbells, etc. I noticed something remarkable hanging next to the door and shook my head in disbelief. Here of all places? I turned to my wife and excused myself “Honey I need to check to see if what I am seeing is what I think” She rolled her eyes and then smiled, this was code for ok I found something that will only interest me and not her. 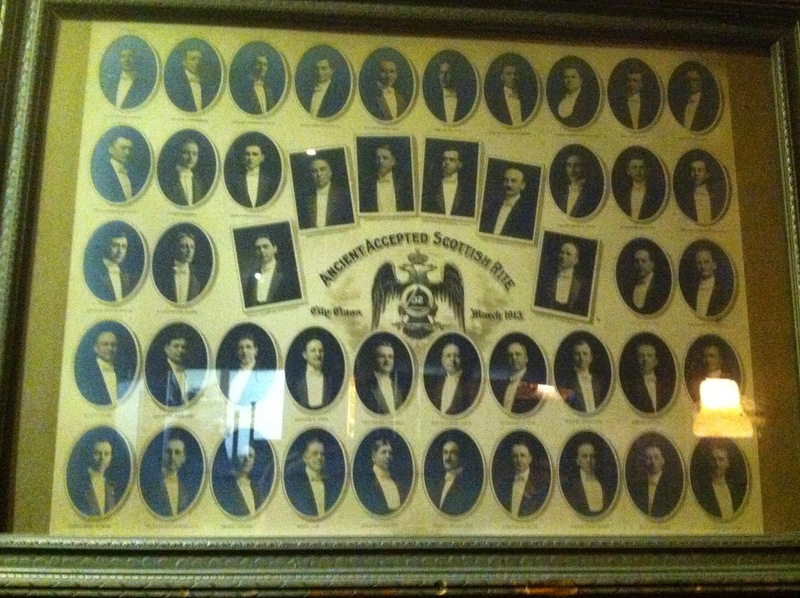 To my surprise it was a Scottish Rite reunion photo from 1913, labeled City Masons. I snapped the photo and sent it to a few brothers that were also Scottish Rite masons. Our waitress comes along and asks if everything is all right and do you need anything else? Me: “To be perfectly honest, I am a Scottish Rite mason and how may I relieve you of that photo on the wall?” He looks over and replies: “Give me a few minutes." After looking at the photo and then going to the back room the manager returned: “Make me an offer.” To which I replied: “25 dollars.” he counters “20 dollars – sold.” He then removes the photo and frame, from the wall, wraps it up and hands it to me. The photo’s journey was on its next leg, back to my home in Rockland County NY. At home, I study the photo and find it was taken by a firm from Indianapolis. Since traveling in 1913 was expensive it made perfect sense this was done for that valley. I researched to see if the photo was genuine by checking the internet for any of the brothers, in the photo. I found 3 of them, one of which owned a drugstore in Broad Ripple. I tried several venues in contacting the Valley and finally reached Brother Mark Dill, 33rd degree mason, at the Scottish Rite Cathedral in Indianapolis. We talked about the photo’s journey thus far, winding up in a TGI Friday’s in Rochester and now in my house in Rockland County. He was delighted and then checked the picture room. They have photos since 1880 and indeed it was an actual photo. The original is 3’x7’ and they would appreciate a smaller copy to be hung in the museum room, which was being updated in preparation for the 150 year anniversary in the state of Indiana taking place in 2015. Also, he would be happy to reimburse me the $20 purchase price and to please ship it to them, as he didn’t want me to go out my way, time and expense, for something that can be easily shipped. To which I exclaimed: “My brother, it isn’t about the money and we are traveling men, it would be my honor to visit and present it to you in person." A year later, I am working in Ohio and 5 hours away from Indianapolis. After several Masonic visitations in Ohio, I let some of the brothers know that I was journeying to the Cathedral to return the photo and asked if anyone wanted to come along. Two brothers: Cory Miller and Mike Zanella, from the Valley of Columbus, accompanied me on the historic journey. (Thank you my Brothers for the company, fellowship and photos taken). 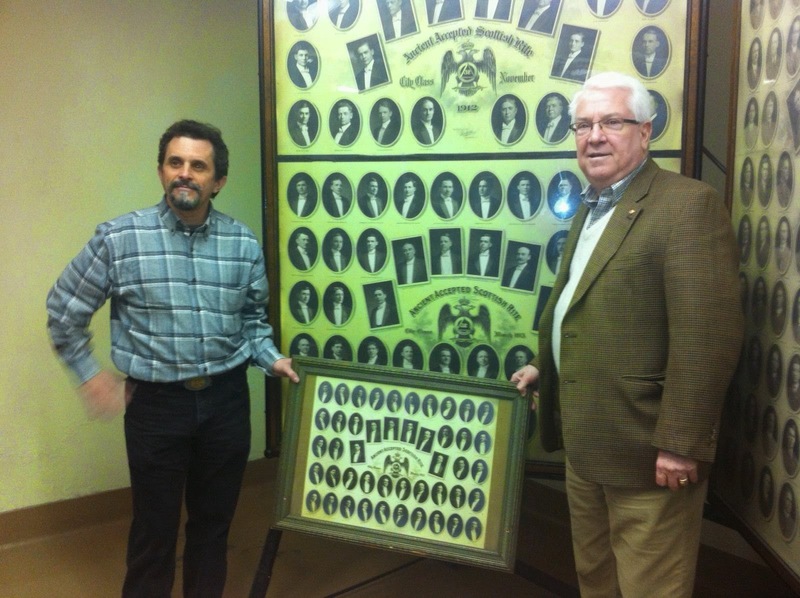 The photo was returned 101 years to the month for the 2014 reunion, which I was unaware that it was being held. We were given the grand tour of the Scottish Rite Cathedral, which was simply amazing and I believe all masons should see this marvelous landmark to the craft. Bro Steve Carrobis (left) presents the frame and photos. Indianapolis March 1913, owner of the picture is yet unknown. Date?? Somehow it wound up in a TGI Friday’s warehouse. April 2013: Found 100 years later, on the wall of the TGI Friday’s in Rochester NY, and retrieved. March 2014: Brought to Ohio, where brothers got to see it and then journey with me to Indianapolis for its final stop. 101 years, the visage of 46 brothers traveled from Indianapolis to New York, to Ohio and finally back to its home in Indiana to hang on the wall of their museum with a most unique history. So I ask again, what would you have done? No 13th Floor? It Must Be A Masonic Conspiracy!